The PoolParty Taxonomy & Thesaurus Manager is a world-class tool to build and maintain your information architecture. It differs from other market solutions for taxonomy management by powerful capabilities like corpus analysis. You can extended those gradually. Build a thesaurus and model your knowledge ecosystem. You create a powerful foundation for better contextualised information. The PoolParty thesaurus manager enables you to start your work with minimum training. Subject matter experts can model their fields of expertise without IT support. PoolParty taxonomy management software applies SKOS (Simple Knowledge Organization System) and SKOS-XL. The W3C standards that ensure interoperability of your thesaurus with other taxonomies, knowledge graphs and APIs. 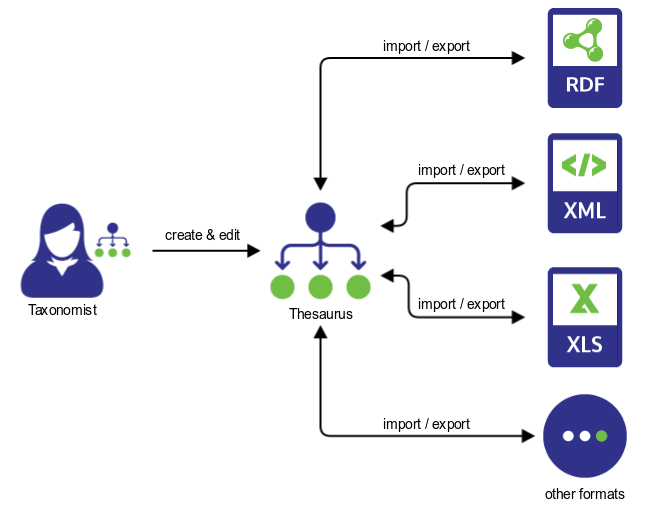 PoolParty lets you import existing taxonomies and thesauri (for example from Excel or XML). You can also export them to different standard formats.